Industrialists are focusing more and more on developing off the grid energy production technologies to provide Africa’s rural areas with electricity. EDF, Schneider, Bolloré are all pioneers in this domain. Pour fournir de l’énergie aux zones rurales, les industriels misent de plus en plus sur des unités de production autonomes. EDF, Schneider, Bolloré font figure de pionniers dans ce domaine. This article was translated from French. Click here to read the original from Jeune Afrique. Energy companies now say that the best way for Africa to meet its growing electricity needs is by investing in off the grid, decentralized energy production technologies—known as microgeneration. If one takes into account the low population density of some of Africa’s countries, it no longer makes sense to construct large-scale electrical networks costing billions of dollars, when cheaper technologies exists to provide local solutions to Africa’s electricity problem. Thomas Gottshalk, German entrepreneur and Mobisol founder, has already installed 5,000 microgeneration systems (solar panels in this case) in Kenya, Tanzania, and Rwanda. These solar panels are managed remotely and clients pay their electricity bills, ranging from about 10 to 50 dollars a month, on their cellphones. The cost of the bill is not much more than the average African spends on candles and kerosene for their lamps. Frenchman Vincent Bolloré, land logistics leader in Africa, has made energy innovation one of his main priorities at Blue Solutions. Over the course of twenty years, the company has worked to develop plans for numerous battery based energy solutions. Full-scale testing for the deployment of these solutions in Africa began in Guinea-Conakry while the Bolloré group was engaged in renovating a railway there. 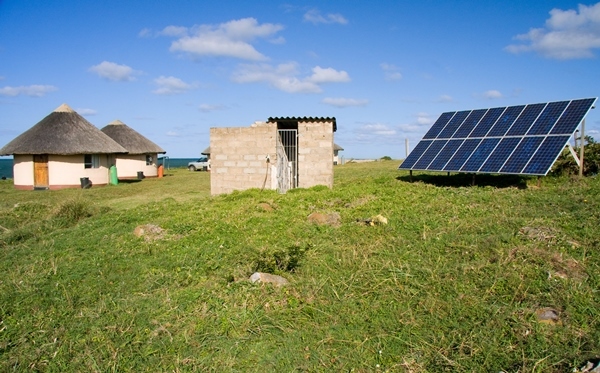 Self-sustainable homes, rural energy dispensaries, and electrical buses: the business opportunities seem endless, so long as the group is able to apply their model on a continent where about 600 million inhabitants are not connected to an electrical grid. Another electrical giant interested this potentially large market is Schneider Electric. The French company is the world leader in electrical distribution, and has developed a technology called Microsol—a thermodynamic solar powered generator that uses hot water to store energy. However, the average price of a Microsol unit runs at around 1 million euros, making to it difficult for African villages to buy one. Although donors are currently spending hundreds of millions to finance large power plants, decentralized energy systems could also attract funders going forward. The International Finance Corporation (a subsidiary of the World Bank) has begun working with Edouard Dahomé, the Director of EDF’s Africa and energy access branch, to develop off the grid electrical solutions in developing countries. This alliance is clearly aimed at electrifying Africa, with tests scheduled to start in Benin in the near future. Article Translated by Matthew LaLime, Staff Intern with the Africa Program at the Wilson Center.